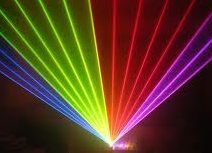 Indoors or out Laserfire has a range of laser shows suitable for your event. Our outdoor multi-colour lasers will project images on to buildings, trees or any solid object. Aided by smoke, either from our own smoke generators or from a separate outdoor entertainment like fireworks, its beams can also become a focal point on their own as they radiate into swirling tunnels of light or sky-piercing blades that rotate and dance in the night. Our three-colour beam lasers are also great for indoor use in rooms which have plenty of space, like a hall, conference centre or nightclub. They produce the same exciting effects as outdoors. Once again smoke or mist is a vital ingredient for the beams to be visible. Walls can be used to project messages, logos and other images. Music plays a key role in making our laser shows sing and dance. We can choreograph a laser show to any piece of music and combine with other effects like fireworks, flames and illuminated water fountains. Watch this brilliant example of laser flame and light show.